We often think of drowning as a loud, splashy affair. That’s where we’re wrong. Drowning often happens without a single sound or a cry for help. I haven’t gone to church regularly in almost six years. There was no big falling out, no spiritual abuse, no change in belief. Life happened and I slipped under the water without a sound. I don’t think anyone even saw me go. Sometimes when the water overtakes you, you hope for a lifeline. Sometimes you’re content to go quietly. I guess I was the latter. It started with my third pregnancy. The morning sickness did a number on me. With two toddlers at home PBS was the only way we made it through most days. There was a month that I really didn’t even leave the house. A month. When my mom picked me and the kids up one Sunday morning while my husband worked, I cried. She took me to church wearing clothes I had worn to bed the night before, no makeup, and tears the whole way. Surely this must be the bottom. I got to church and saw how wrong I was. Bottom came when I realized no one had noticed my absence. The morning sickness passed and I made sporadic appearances at church, but a few months later I had an infant and two toddlers and my husband worked weekends. Survival was at the top of my list; dressing and pretending everything was fine was not. Weeks turned into months. Every so often I would rally my energy and give it another go at church. Every time I went I was slapped by the smiles and “good to see you” responses that didn’t extend past 11:45. I am not placing blame. I retreated. I let go. I gave up. But I will say that no one came after me. Now, it’s almost six years later and I still haven’t found a home. It makes me hold my breath like I’ve been punched in the stomach. I have no way to fix it. I have no great understanding. I’m left sad and unsure. So I’m doing one thing. Exhaling. Exhaling the name of Jesus. Because I want Him more than a church. 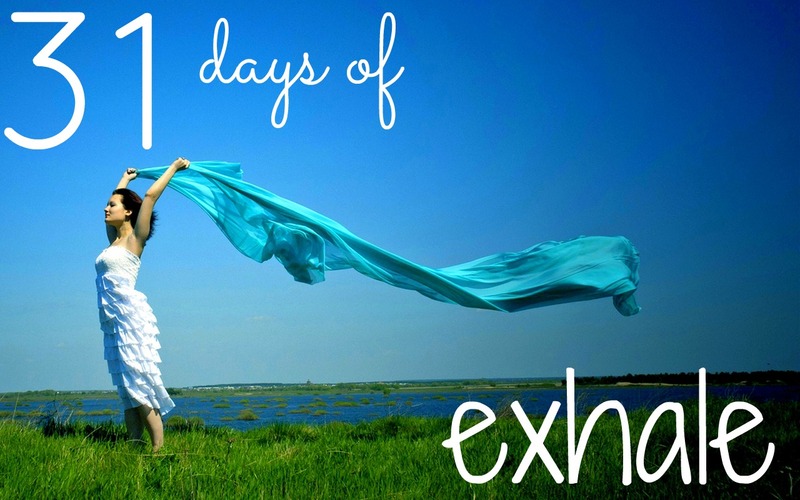 If you missed any of the series, click below to find your own exhale. This resounds with me oh so much. Your blog is beautiful, your words pull at my heart. I am glad i found your blog after you commented on mine today. I’m so glad to hear that. Thank you so much Tania!